You may now wake up. "RoboAdvisors" like Wealthfront and Betterment were scientifically designed by sleep specialists. Their goal was to ensure that your financial life is so incredibly boring, that you fall asleep during your prime investing years. How it feels to use Betterment. How it feels to use Collective2. There's definitely a time and place for sleep-inducing investing. But there's also a time and place for sheer, exuberant speculation -- for trying to beat the house and go home happy. At Collective2, we can't make any promises (that you'll beat the house), but we can at least promise to try to make you go home happy. Collective2 is a marketplace of automated trading strategies, all of which are trying to outperform the market. Many are risky. Some will lose money. But some will succeed. 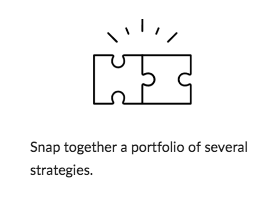 Your mission, should you accept it, is to use your own taste, intelligence, and talent to build a portfolio of strategies, and try to put some sizzle into your own personal portfolio. 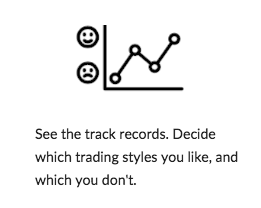 Once you choose your strategies, trades will happen automatically in your regular old brokerage account. You keep all your money in your own account. Collective2 is kind of like a hedge fund. Except, for the Internet Age. And for Internet-y kind of people. Collective2 is not right for everyone. Set up your completely free Collective2 account.